Regardless of the type of lock you use in your office, we can figure it out. Learn more. Get the benefit of 20+ years of home locksmith experience. Learn more. Automotive and car locksmith for all makes and models. Learn more. "Best locksmith around! Wouldn’t use anyone else. Always quick, super helpful & friendly! Have you found yourself locked out of your home in the middle of the night, felt foolish after being locked out of the car, or panicked upon realizing that you can’t open your house with your own key? During these times, you might call just about any locksmith that you can find. Your security is at stake, and this is when you need the most reliable name in the locksmith business to help you out. Choose A-Access Lock & Key. We are the key to your security! 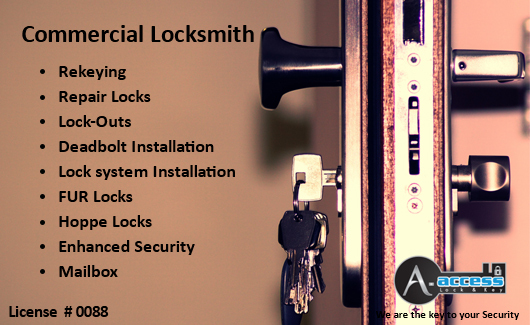 We at A-Access Lock & Key understand the necessity of needing emergency locksmith services. Nothing is more nerve-wracking than having to stay outside your home at odd hours or having your home without a lock because the lock on your door decided to stop functioning. With emergency locksmith services all that you would be required to do is to give us a ring and we would be on our way to have things done in no time. In times like this, it is highly recommended that you should have signed up with trusted Locksmith service providers to avoid the hassle when things go wrong. With our mobile locksmith team on the move, we are at your service to assist and have it handled by our experts. With the above-detailed description of all the services we at A-Access Lock & Key offer you should be at a point to conclude with your locksmith service providers. Who Are A-Access Lock & Key! A-Access Lock & Key is a trusted Locksmith company in Charlotte, North Carolina offering Commercial Locksmith Services, Auto Locksmith Services, and Residential Locksmith services for people who need an Emergency locksmith Services. Our name is synonymous with quick response times, effectiveness, and reliability. We offer a wide range of locksmith services. Our insured A-Access Lock & Key team caters to household, professional, car, and industrial clients that are looking for an Trusted Locksmith Charlotte NC they can trust. For decades, A-Access Lock & Key has built our reputation as a top Locksmith Charlotte. We are a company that people can rely on whenever they run into trouble with their locks and security. Just give us a call and our mobile service team will rush to your rescue like Superman! We offer our services 6 days a week and are sure we can help you out, no matter what your situation is. The moment you call us at 704-545-5410, A-Access Lock & Key will dispatch an experienced locksmith technician to your location. Whether you’re at home, in the middle of the road, or in the office, our Insured Locksmith will be there. We’ll be there in no time. That’s our guarantee! Access your home, commercial establishment, industrial space, or car with ease, and get everything back to normal. Our Trusted Locksmith Teddy Poulos on the left is what a real Emergency Locksmith looks like. Why Certified A-Access Lock & Key? Our customers love and value our locksmith and security services because of our reputation as a long-time Locksmith Charlotte. A-Access Lock & Key is a proud certified member of the Associated Locksmiths of America (ALOA) Security Professionals Association Incorporated, and an accredited business in the local Better Business Bureau (BBB), with an A+ rating. Angie’s List has also given us an A rating as well as the 2013 Super Service Award, further improving our good reputation. Both our A-Access Lock & Key Google reviews and Yelp reviews are 5-star as our Emergency Locksmith address our customers’ issues right away. A-Access Lock & Key is completely family founded and managed, which is one of the secrets of our two-decade history. Over the years, our services as commercial Locksmith Services and residential locksmith Services have saved thousands of customers from being locked out or from having their security threatened at home or in their commercial establishments. They trust our Emergency Locksmith Services, and you should too! Each locksmith employed in our A-Access team is a skillful technician who has been trained for years, complete with the necessary hands-on experience in handling state-of-the-art lock and security technology. We have even worked on electronic keyed locks. Rest assured that our Verified Locksmith Services can solve whatever lock problem you may face. All of our technicians are verified and certified with a Locksmith License from the State of North Carolina Licensing Board. We have also conducted a background check on each one of our Verified Locksmith Services Charlotte members to ensure that you can trust the technicians entering your homes. Feel free to check our technicians’ license, too! Your trust, safety, and security are important to us. This is why we provide our Bonded locksmith Services with a million dollar liability insurance. We are also bonded and can even provide professional references if you ask for some. We at A-Access Lock & Key only use the latest tools and technology. This is how we keep our promise of providing only the best possible locksmith services, be it for residential Locksmith Services, commercial Locksmith Services, Auto Locksmith Services, or industrial purposes. We make it our mission to provide quality services and security solutions to everyone. We are an Trusted Locksmith Charlotte NC and can get to anywhere near your area in a matter of hours. Aside from sending an Trusted Locksmith right to your location, we maintain a large inventory of unconventional products. Whatever lock problem you have now, trust us to find a way to resolve it. We can even give you a free estimate! "I am very pleased with the timing and efficiency of A-Access. Very friendly and does great work. We will use A-Access for any future work we need for lock and keys. Thanks for a great job!." A Locksmith Provides the Profile of a Burglar! Our Emergency Locksmith Charlotte NC profiles a burglar and tells you what to know to prevent your house from getting robbed. Read more. Should You Change Your Locks After Buying a New House? Are you wondering whether changing your new home’s locks is worth the effort? Let’s find out with the help of our Locksmith Charlotte NC. Read more. It’s time to get the answers you’re looking for. Our Bonded Locksmith Charlotte NC has decided to answer your most popular questions. Read more. Are you in need of locksmith services? Call our Expert Locksmith Charlotte NC right away because A-Access Lock & Key is the key to your security! Driving Directions From A-Access Lock & Key - We Can Reach You! Why should I use a Professional Locksmith? You want a Professional Locksmith to ensure that you get it right. For this reason, a Professional Licensed Emergency Locksmith brings experience and a wealth of knowledge regarding locks, keys, and security problems. Also, they are bonded, certified, and verified, by their state’s board. In our case, it’s the North Carolina Locksmith Licensing Board. Is there any difference between rekey and master key? Yes, yes there is. ‘Rekeying’ means adjusting the tumblers in an existing lock so that only new keys can open it. A ‘Master Key’ refers to a key that can open multiple locks. Can you service a mail box lock? We sure can! Our Mailbox Locksmith Charlotte NC will come right to your home in order to match the lock that fits your mailbox. Yes, of course! In addition to our standard residential, auto, and commercial locksmith services, we also function as an Emergency Locksmith Charlotte Locksmith. With this in mind, we can unlock doors as well as replace keys and repair security hardware. How can I pay for your service? We accept all forms of payment, including cash, credit cards, and checks. Never conceal your home entry key under the mat! Pick some place 15-20 feet from the entryway or even better, give your extra key to a friend or faithful neighbor!